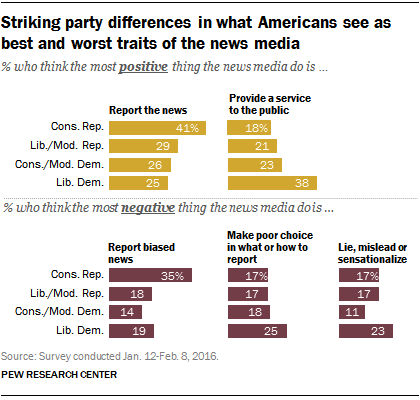 Americans are divided in what they consider the most positive and negative attribute of the news media, and much of that divide follows party lines: Conservative Republicans and liberal Democrats stand far apart in their views of what the media do best and worst. Conservative Republicans, for example, are more likely to say that reporting biased news is the most negative thing the media do, while liberal Democrats single out poor choices in the news they cover or how they cover it, according to a Pew Research Center survey conducted Jan. 12-Feb. 8, 2016, in association with the John S. and James L. Knight foundation. The survey asked Americans to volunteer what they thought was the single most positive and negative thing the news media do. Nearly as many say the news media provide a service to the public (25%), such as informing people or acting as a watchdog. The other most positive traits mentioned, though by no more than one-in-ten Americans, are the media’s reports on uplifting or positive stories (8%) and their practice of high journalistic standards (6%). Additionally, 8% say the news media do nothing positive. There is also a lack of consensus over the news media’s most negative trait. About two-in-ten Americans (22%) say the most negative thing the media do is report biased news, while 18% point to a failure to make good choices in what or how to report the news, such as too narrow a scope or reporting on things that aren’t newsworthy. An additional 16% think the worst thing they do is lie, mislead or sensationalize, and 14% highlight too many reports on negative stories, such as guns and crime. Much of the division in the best and worst attributes of the media lies among partisans on each side of the ideological spectrum. Conservative Republicans are much more likely than any other group to say that the most positive thing the media do is report the news; 41% said this, at least 12 percentage points higher than any other group. Nearly four-in-ten liberal Democrats (38%), on the other hand, highlight the public service aspect of the news media, about twice the share of conservative Republicans (18%) and higher than any other group. When it comes to the most negative trait, about a third (35%) of conservative Republicans say the worst thing the news media do is report biased news, nearly double that of any other group. This is consistent with previous research that shows that conservative Republicans, more than any other group, believe that the news media tend to favor one side when they cover political and social issues. Liberal Democrats, on the other hand, focus more on poor choices the news media make in what qualifies as news or how it’s reported. A quarter of liberal Democrats point to this, compared with 18% of conservative/moderate Democrats and 17% of both conservative Republicans and liberal/moderate Republicans. Liberal Democrats are also more likely to focus on instances when they believe the news media lie, mislead or sensationalize in its reports. Note: Topline of survey questions is available here (PDF). Joel Ericsen is a temporary research assistant at Pew Research Center.